Libya is in turmoil, and dictators throughout the middle east are on edge after the revolution in Egypt. It's a revolution that owes much of its success to Muslim women. "Their participation had been one of the main factors I think that made this successful, made this inclusive, that gave it this democratic tone," says Hind Zaki. The University of Washington graduate student took a quarter off from her studies to return to her native Egypt, during the revolution. The world watched older women, wearing traditional Muslim garb, leading chants. Younger women appeared on YouTube asking others to join the protests at Tahrir Square. "We don't want the (Mubarak) regime," a T-shirt and blue jean clad woman told the English speaking media, "The next president of Egypt will be chosen by the people." Despite Egypt's legacy of strong female leaders including Hatshepsut and Cleopatra, "there is this portrayal of Arab women and Muslim women as submissive or downtrodden or miserable," Egyptian novelist Ahdaf Souief told a documentary reporter during the revolution. But she insists that is not the case. Zaki notes that many Egyptian women work outside the home and are active in professional and political groups. But women have been underrepresented in modern Egyptian government. They are barred from certain jobs. Laws favor husbands over wives. A UN study shows most women in Egypt have been harassed, verbally or physically, on the street. "It has been an ongoing battle and there are areas of course where women do suffer," Zaki says, "I'm not going to paint a bright picture here." Yet she insists, "there has been a very active movement that has been working to improve the situation." 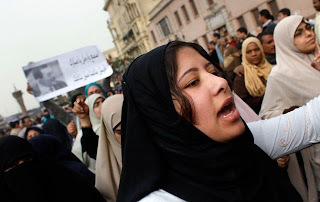 There were signs of progress as women joined the protests in Tahrir Square. They stood shoulder to shoulder with men, without being groped or harassed. "There had been this incredible sense of safety in public spaces that hasn't been felt in a very long time," says Zaki, who joined the protests. It did not last. On the day Egyptian President Hosni Mubarak stepped down, and more people joined the celebrations in the streets, CBS correspondent Lara Logan was beaten and assaulted. Zaki says the atmosphere that day had become "more aggressive." Egyptian women reported that the safety they'd felt in the previous days seemed to disappear. With the revolution over, was the new sense of equality finished, too? Activists hope it is only a setback. They point out Logan was rescued by women and by members of the military, which now controls the government. And through the revolution, modern Egyptian women have found a stronger voice. When asked if the revolution could have happened without women, Zaki says, "I don't think that would've been possible at all." "Whatever happens," Souief said at the height of the protests, "that moment has happened. There can be no going back." Zaki says if Egypt wants to keep the democracy it's fighting for, it needs to listen to the voices of all of its people. "We are willing to accept a democratic transition that will ensure that democracy and the rule of law are prevalent in Egypt. This is really the only guarantee for the rights of women for the rights of religious minorities and for the rights of whoever." Zaki says after she gets her degree from the University of Washington, she hopes to return to Egypt and work for human rights.